You know how I told you that you could sell other people’s stuff in chapter 7 well this is the other way round. You get others to sell your stuff. This means becoming a merchant and finding affiliates to perform affiliate marketing of YOUR product. They have too high quality control procedures. This is in breach of what I tell you to do all the way through this book. The reason for the disparity is because these middlemen want sites that are attractive to affiliate marketers. Affiliate marketers do not want to send visitors to a site where the visitor can easily click away from the site but the site gets paid by pay per click or affiliate links. Nor do they want the visitor to go direct to the contacts page and make a sale direct thus cutting the affiliate out of the sale. Nor do they want it to be easy for the visitor to leave the site because they want you to stay on the site for as long as possible as you will be more likely to buy. This is why the sites I recommend you create are affiliate unfriendly for these middlemen. However creating an affiliate program that cuts out the middlemen is attractive as you will get the smaller websites being less fussy and marketing your site because its very relevant to their site. Only once you get to a certain level (say turnover £5m) should your consider grooming your site for these middlemen sites or create an “affiliate friendly” site alongside your own site for the middlemen websites to market. “e-commerce”, click on that and then go to “your affiliates” and then “configuration” and then “Edit Configuration Now”. This is the commission you pay someone if they make a direct sale from promoting your product. So if you sell something for £100 and you set level 1 commission at 80% then the affiliate will earn £80 for every sale you make that has been referred by them. I like to pay out highly on level 1 as it encourages affiliates to market your product. I mean think about it – would you prefer to market a product that returns you £80 per sale or £8? So try to tempt them in this way and then this will get you more visitors to your site and possibly more subscribers to your newsletter. This is the commission you pay someone who has referred you someone who is going to sell your products. In other words you have referred a referrer! Then level 2 commission is the percentage of the referrer’s commission payable to you. I set this at 10%. So for example if Joe had a site with my affiliate link and I was paying 80% on level 1 and 10% on level 2 and Rob clicked through joe’s link, signed up as an affiliate to my site and Rob made some sales resulting in £800 commission then Joe would be entitled to £80. This is because Joe is entitled to 10% of whatever Rob earns in commission. The beauty of this is that you may recruit an affiliate that is good at recruiting affiliates only and is just happy to receive the level 2 commission rather than rely on level 1 commission. Then you can have affiliates recruiting armies of affiliates with these level 2 affiliates sitting back while their sub affiliates do all the hard work. This is another way some people have made serious money. Entrepreneur Ajay Ahuja shows you how to make £1m fast! Join the biggest property portal website in the UK for FREE! So think of some punchy text links that are eye catching and explain your product or service in very few words. Then tell them to embed their affiliate link in to the text link. I cam across this guy who had written 10 books on property investment and started with only £500 but is now worth £10m. He gives a load of free info, tips, books and even a tenancy agreement. I’ve used some of tips to make myself a few quid. Visit [YOUR LINK]. There’s tons of information there so I’m sure you’ll find something that will help you. This advert informs the reader that my site has a high number of subscribers and there are plenty of like minded investor’s opinions on my site for them to browse. I also highlight the live chat facility which almost all property websites do NOT have. If you’re looking to stay up to date with the property market then this guy, Ajay Ahuja, reckons he can keep you fresh with all the latest hotspots in the UK. I’ve read some of his books so I know he knows what he’s talking about. His last hotspot was near where I lived so rushed over there quick time and he was right – there were some bargains! Again this advert reinforces my credibility because I have written some books on the subject of property investment and that they have followed my advice and profited from this. This advert tried to identify with the reader’s pain of going to work with the hope of triggering with the reader some kind of empathy. It also hinted that you could find your true dream job from joining up to this email series. So write something that’s like an advert or an article which highlights the benefits and features of your products or services. I give them graphical banners I create in MS Paint. If you have a bit of graphical know how then consider creating a banner that is eye catching. I have to admit, the internet is becoming immune to banner advertising but some affiliates till swear by them so try to give them a banner or banners to download. I started investing in property in 1996 with only £500 and now I own a property portfolio of 150 properties worth over £10m. I can already hear you – “it was easier back then!” Ironically it wasn’t. Let me explain a little more. The buy to let mortgage had just emerged when I first started with only a few banks offering such a product. The banks that did offer such a mortgage were unsure, as this was a new territory for them so they used to knock back a lot of properties that I wanted to buy. It was only really in 2001 that the banks got to grips with the buy to let mortgage and hence I was really able to expand my portfolio of 10 properties to now 150 properties simply by investing in hotspots. It makes me laugh when I read in the press that buy to let is dead. Well of course it is in most areas! But in some areas it is still waiting to boom. These areas I call hotspots. In 2004 alone I bought 50 properties. I bought in Hull, Stoke on Trent and Grimsby. These properties are no longer hotspots, as they are too expensive now. I’ve experienced 100%+ capital growth in 1 year which is well received but halts my buying sprees. I intend to buy 100 properties this year EVEN though all the so-called property experts are saying we are heading for a crash. Therefore I am always looking for new hotspots in the UK. At the beginning of this year, 2005, I bought a property for £3,000 and another property for £9,000. And yes, they were in the UK. What if I told you I bought these properties without my money – would you believe me? Well its true. I bought it with the bank’s money not mine. They even paid my legal costs! I did not put one bit of my savings to acquire these properties. I am sure you are aware that the loans and mortgages market is an extremely competitive market out there. The banks are desperate to lend and it seems they’re not too fussy about your credit history either! You’ve seen the numerous ads on the TV and the newspapers promising you a decision in minutes and a cheque in days. Now just imagine if you managed to get 10 or so of these properties. You would be looking at clearing around £2500 per month anywhere between years 1 to year 4. That’s £30,000 a year. I remember when I used to earn that working a professional Chartered Accountant for 50 hours a week. I now earn 10 times that working 5 hours a week! * I don’t care about the national price index, as this is too general. All I’m interested in are properties that make me money NOW. This means that after my borrowing costs there is some left over for me to spend. If the property grows in value then great but if it doesn’t then - So What? If I’m making money every month then the capital growth is just a bonus. So what happens if the price goes down? Well again - So What? I’m not selling the property as the property makes me money every month. In fact if the price goes down I’ll just buy more! Start with nothing - just like I did! I’m sure you’ve all heard the only way to get rich is by using other people’s money - and this is very true. Do not believe that if you work hard and pay for everything with your own blood, sweat and hard earned cash you’ll get on. That way is the mugs way. You’ll be working till you hit retirement age and probably beyond! When I first started, no one had heard of me and I raised £500 in a day. Back then that was a lot of money to me. I used this £500 to make my first investment. After I caught the bug I started asking for more! I started to ask for £5,000 and more and most would say no but some would say yes! Okay, I had to pay it back, but with the investments I made I paid them back and made 20 times more. I’ll show you how you can raise £000s easily and fast. Property values rise in the LONG term. So not in 1 month, 1 year or even 5 years. But over a period of 10 years or more. So if you are considering investing for a period of longer than 10 years you can be sure that your wealth will grow. So how can you lock in certain capital growth? Well you can’t! But you can make a damn good prediction that it will. Take those two properties I bought for £3,000 and £9,000. How affordable are they? Do you think a first time buyer could afford to pay £3,000? I’m quite sure they could. How attractive are they as investments? Do you think there are many investors seeking a yield of 100%? I’m quite sure there are. So if I were to try and sell this property I would get interest from both first time buyers and investors. So what would each of them be willing to pay? Well the first time buyer could afford 4 times salary – so this would equate to around £60,000. The investor would be interested in the property if it yielded 10% so this equates to £30,000. So I could safely say the property is worth anywhere between £30,000 and £60,000 at some point in time. I would reckon 3 to 4 years. Notice I have not based the predicted price on HISTORICAL growth patterns, as they are IRRELEVANT. The past has nothing to do with the future when it comes to making investment decisions or predictions. Newspapers Place ads in free newspapers and magazines, local papers, tabloids and broadsheets. Classified sections would be a good place to put them as it will be cheap. Email Send an email to your friends list, work group list, your subscriber database or any other list you have. You could also tag it on to the end of every email message you send. Use the newspaper advert examples above. PLEASE NOTE: Do not spam. If you do not know the person and you’ve just got the email from a website then do not send as the email will get reported as spam and will not get through. Website Create a website and use your number and affiliate link as the only contact. In person Tell your friends, family, business contacts, work collegues, people on the street and whoever you come in contact with! You could get flyers made and hand them out or post them through people’s letterboxes. If you’re a member of a club you could give out these flyers to all the members or place a well positioned poster on the notice board. Split your commission You could offer to split this to another introducer. This could be anyone you know, a shop keeper or simply someone you know who knows a lot of people. As long as you track the people they introduce there should be no problem in paying out commissions. Post message on online forums You can mention my services on money making or property forums and informally tell them about my services. You could also add at the bottom of your messages the newspaper adverts mentioned above to generate interest. So all of the above information from text links, adverts, banner advertising, article advertising and further ideas form the Affiliate home page to which you make the landing page after an affiliate signs up. This way they can get straight in to promoting your products and services because you’ve given them the tools to do so. Then write a sales pitch about becoming an affiliate. You now have an affiliate sales page which convinces potential affiliates to sign up, a sign up page hyperlinked to the phrase “sign up now” and a login page where affiliates can check their stats and performance of how well they are selling your goods. That’s all you need to do to create a system where visitors can come to your site and start selling your stuff AUTOMATICALLY. What I have talked about in this book has taken me 2 years to learn. If I were to split the time between researching and actual learning time I would say I have spent half my time finding out what to do and the other half teaching myself how to do it. If you are truly determined to make money on the internet and you are starting as a complete novice then you can start making serious money by 1 year. If you’ve got a bit of experience with using online software then I reckon you cut that time down to 1 month if you work at it and are not afraid of trying out new things and changing the model when its not working. The internet is moving and growing at such a fast pace that there is new technology coming out that is making routine tasks easier and easier. Its applying these technologies that benefit others that makes money. I wish you every success with your projects. I know that if you’ve bought this book you’re ahead of 95% of the rest of people. 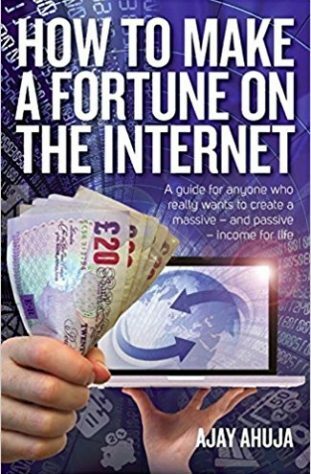 One day we will all be on the net and we will all have our own websites, just like mobile phones, but at the minute the market is wide open for some of us……..to make a whole load of cash!